Even if one time Sri Lanka's Counsellor at the Embassy in Japan did not attend a Foreign Ministry inquiry over an act of alleged misconduct, one that embarrassed the country in no small measure, Dr. Tilak Attanayake, has remained busy. The one-time non-career diplomat, who was accused of bringing into Sri Lanka a piano, an antique clock and an expensive wall painting - items that belonged to his landlord -- when he completed his term, appears to have successfully concluded negotiations with his property owner. He is alleged to have brought these items without his consent. The gracious landlord has now agreed to allow Dr. Attanayake to keep the piano. However, the latter will have to return the alarm clock and the painting to Tokyo. As a result, the landlord will also release one month's rent he held as deposit for the apartment where Dr. Attanayake lived. Though Dr. Attanayake at first denied bringing the items to Colombo and produced his shipping list as proof, he could not sustain that position. The shipping company that freighted the goods by sea to Colombo had its own list where the piano, the clock and the wall painting were listed. Other than the piano, the landlord had said, the other items were of great sentimental value to him. It is not immediately clear whether the Ministry of Foreign Affairs will still go ahead and call in the Police to inquire into the matter. 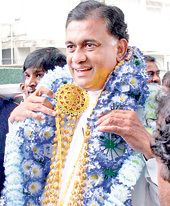 Dr. Attanayake kept away from the Foreign Ministry inquiry though summoned. Moreover, the damage to the reputation of Sri Lanka's foreign service and the country, officials say, was irreparable. 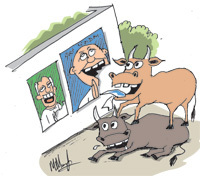 The cattle in Kalpitiya had a feast in the run up to the two elections. Cattle and goats that have little to feed on in this area, where grass hardly grows, feed on whatever they get hold of -- paper, cloth, cardboard. Cattle were seen lining up to get to the walls where posters were pasted. They had plenty of posters to feed on. To get at the posters at higher elevation they climb on each other and tear them up. Cattle relished the feast even more as the paan piti paappa (flour paste) used for pasting posters made them tastier. A witty vendor was to remark that the cattle are far more efficient than the police. That is not all. He told passersby that cattle should be employed to do the removing of posters at the next elections. Poor policemen seem trapped. If they remove some posters, their transfer would be to a difficult station. 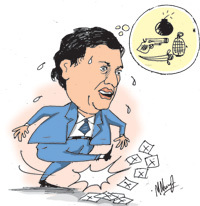 It happened to a UPFA candidate, a key player in a minority party, in the East. Early reports spoke of his having lost Thursday's elections. Pronto, he detailed his men to buy up all the Tamil newspapers that came to his area. He did not want the story of the defeat to spread. His supporters did what the boss ordered. However, early on Friday, the candidate had learnt that he had won the poll. His lady boss, however, had lost. It seemed a parting shot. Outgoing Foregn Minister Rohitha Bogollagama was at a counting centre in Colombo throughout Thursday night and the following day. When counting ended, he learnt he was not one of those who had won. He was not only disappointed but angry. On his way out, he kicked a couple of ballot boxes that lay on the ground. With the final vote tally in Colombo coming in, it became clear the people voted for LK to be erected, i.e.the statue of the great Foreign Minister Lakshman Kadirgamar to be erected at its due place — Horton Place LK Institute. A tailpiece to last week’s Cafe item titled "Her minister's secret service": --No sooner the Colombo’s preference vote count became known (unofficially), the Foreign Ministry unit disseminating election results to all Sri Lanka missions abroad, just stopped sending any further information out. Voice of the people shutting down an essential service? Then again, the same persons in 'the Ratawal Balamu' bandwagon are now painstakingly sticking their ears to the ground to find out where they have to head next on "all fours"!